April 28, 2016: Yesterday, the Language Creation Society filed an amicus brief (and exhibits) in Paramount v. Axanar, to oppose Paramount’s claim of owning a copyright in the Klingon language. Axanar is a planned feature film set within the Star Trek universe, following on the short film Prelude to Axanar. Paramount and CBS sued the film’s producers, alleging that the fan film infringes on the studios’ copyrights in Star Trek, such as the characters, settings, costumes, logos, and plot points — as well as an alleged copyright to the Klingon language itself. Klingon is a constructed language (conlang) created by linguist Marc Okrand for the movie Star Trek III: The Search for Spock. 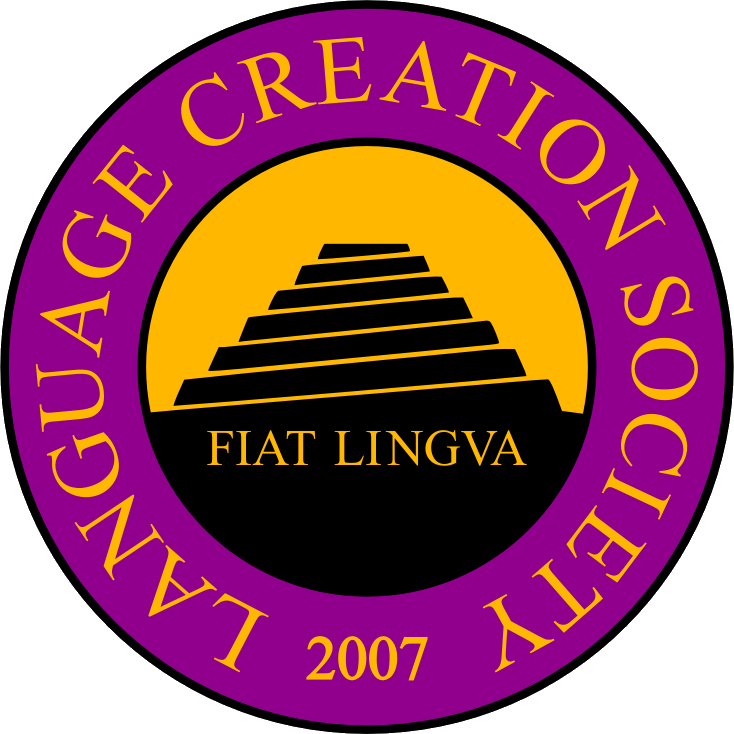 The mission of the Language Creation Society is to promote the art and craft of language creation. Allowing copyright claims to a language would create a monopoly on use extending far beyond what is needed to protect the original work or to claim credit for the language’s creation. The potential threat of a lawsuit for merely using a conlang, or creating new works to make it more accessible, has a chilling effect; it makes conlangers, poets, authors, educators, scholars, and others less likely to build on and enjoy each other’s work, to the detriment of conlanging in general. We extend our thanks to Marc Randazza for representing us pro bono in this case, and to Samuel Fifer, Heather Khassian, and Marc Mandel of Dentons US LLP for having previously written a detailed legal memorandum for us on how conlangs work within United States intellectual property law, also pro bono. The Language Creation Society is acting on its own behalf, and has no affiliation whatsoever with Paramount, Axanar, or the Klingon Language Institute. Our involvement in this case is strictly limited to constructed languages; we do not have any position on the other aspects of the case. See also press below (including interviews). Please email us at press@nullconlang.org with any questions or if you want an interview. All case filings are here. Feel free to hotlink/embed the folder and anything in it. Paramount claimed that Axanar’s similarity to Star Trek was so substantial that it infringed upon their copyrights. However, Paramount went beyond mere similarity by claiming copyright over the Klingon language. In doing so, they went too far, and claimed something that didn’t — couldn’t — belong to them: an entire language. We were concerned about a narrow slice of the case. As amici curiae, we aimed to address an issue that might not be important enough to the parties, but that the law needs to confront. The Klingon language issue is neither central nor dispositive to the case. But Paramount chose to make it part of the case — and that required a response. After we filed our amicus brief, Paramount tried to downplay their prior claim to own the language. As a result, the court had no need to address the issue directly in its opinions. Given Paramount’s backing down, the independent copyrightability of Klingon was no longer at issue, becoming just one element of similarity — not a copyright infringement by itself. Nevertheless, the Court seemed persuaded by our position, writing that the Klingon language “may not be individually original and copyright protectable”. In its recent response to Axanar’s motion that the jury not be told about Klingon, Paramount backed down further, acknowledging the court’s skepticism and seeking only to use Klingon to show one of many alleged similar elements. ETA Jan. 10: the court has (tentatively) granted that motion, thereby preventing Paramount from claiming to the jury that it owns Klingon. We used Klingon in our brief to show that Klingon is a living language that anyone should be able to use without Paramount’s permission. That in turn had an influence on what we said in Klingon, because using Klingon in a formal filing is already pretty funny. We chose to roll with it and use it as rhetorical tool. After all, Klingon is particularly suited to expressing aggression. It also serves a real purpose beyond this one case. IP law can be dry and technical. The use of Klingon — and humor — helped spread our point that languages are not copyrightable. Our work is already being used in IP law classes; it’ll help shape how lawyers think about copyright. We could not have achieved that goal as effectively with just a staid analysis. Hopefully nobody needs to litigate conlang copyright again… but if they do, everyone will know where to find a top notch argument about it. We use Klingon here to make a point, as well: we have not sought, nor do we need, any permission from Paramount for our use of Klingon — not even when we have created a new Klingon name for Paramount itself: . We thank André Müller and Joseph Windsor for assistance with Klingon translations in this statement. See also Klingon translation notes, with instructions for embedding Klingon. The court decided that Axanar has “objective substantial similarity” to Paramount’s copyrighted works, but will ask a jury to decide whether there was “subjective substantial similarity” and whether Axanar’s infringement was “willful”. In a passing reference to the Klingon language, the court said that it “may not be individually original and copyright protectable”, but did not decide the question. Because the case is going to a jury, and Axanar’s motion in limine 4, p. 9, seeks to prohibit Paramount from telling the jury that they own Klingon, our concern is still at issue before the court. Paramount has yet to respond to that motion. They have the option of conceding that they don’t own Klingon, or simply withdrawing the claim that they do as irrelevant to the case. Either way, they could still use it as an element of similarity. But if they want to continue claiming that they own it, especially if they want to tell that to the jury, they should defend their claim. Paramount, despite still claiming to own the entire Klingon language and anything said in it, has chosen not to defend their claim for now. Our reply rebuts their procedural claims, and challenges Paramount to defend its overreaching claim of ownership of an entire language. In order to prove the point that Klingon is a real language that people who are not Paramount are free to use, our reply, like our original amicus brief, uses Klingon throughout. We have neither sought nor received any “authorization” or “license” to use the language. If Paramount wants to claim to own the language, we welcome their filing an actual defense on the merits. If they want to merely use it as a point of overall substantial similarity, they can tell the court that they are abandoning their claim that the use of Klingon is a separately infringing element. So far, they have not done so. ECF No. 85, Paramount’s corrected motion for summary judgment, p. 9-11 and 17, claims “dialogue” is protected. Earlier this year, Paramount appeared to back off from their incorrect claim of owning the Klingon language, and at the time, the court agreed that our amicus brief was unnecessary to determine the issues. However, both parties continue to make this an issue, so we have renewed our request to the court that it consider our amicus brief. If the court is going to consider whether a language can be copyrightable, or allow a jury hear arguments mentioning Paramount’s allegation of ownership over a language, we believe our explanation of why such claims are wrong should be heard as well. We are involved in this case only on the limited issue of whether constructed languages can be protected by copyright. We believe that they can not. The majority of the case is about whether there is “substantial similarity” between protected Star Trek works and Axanar’s work, whether Axanar is engaged in fair use, etc. We have no position on those issues and do not take any side on the larger dispute between Paramount and Axanar. Note: the renewed motion has a typo for our name. It should say “LCS” (Language Creation Society), not “LSC”. The court has denied Axanar’s motion to dismiss for reasons that do not rely on the Klingon language issue. It therefore denied our motion for leave to file an amicus brief about the Klingon language “without prejudice” — i.e., it told us “not right now”, not “no”. We will continue to monitor the case. If the language issue remains when the case goes to summary judgment, we expect to re-file a refined amicus brief. The LCS has no stake in whether Paramount or Axanar prevails in the overall case. We are only involved in order to argue that copyright law should not go so far as to restrict the creativity that comes from works in constructed languages (conlangs). In analyzing and ruling on Defendants’ Motion to Dismiss, the Court does not reach the issue of whether languages, and specifically the Klingon language, are copyrightable. Axanar’s reply talks about some aspects that we aren’t taking sides on (e.g. particular characters or episodes). Paramount’s complaint, FAC, and MTD response all explicitly claim a copyright ownership to the Klingon language itself. Their opposition to our motion for leave to file amicus portrays them as merely having cited it as part of an overall “substantial similarity” claim against Axanar — but if they had left it at that, we would not have needed to file the amicus. the court dismisses their claim to own the language itself as being without legal merit. For now, we’ll have to wait and see what happens. Both lists are ordered by most recent on top.